Well, I've run out of a few of my most popular soaps so have been working too get them made and cured before people start shouting at me! Last night, I did a remake of our very popular Adam & Eve soap, a black and white, Vanilla Anise fragranced soap (this is a DIVINE fragrance) and Titch and I decided to video the whole process. There are a few technical issues in the video... for one, the video was in 3 parts originally, the first part was silent for some reason (I have no idea why I didn't speak), but I managed to get them all together. Then I left a spoon in one of my jugs and promptly poured a ton of soap on it (d'oh!) and then the video cut off again. But, no matter, it's a good video (I think) so I wanted to show it to you. I'm embedding the video itself but I think that doesn't show up on the email subscription so I'm including the link too. Thanks Celine, a great video. I have a question: is there who adds the initial aroma oils, in the video is not that add color after ... you do first? Celine. 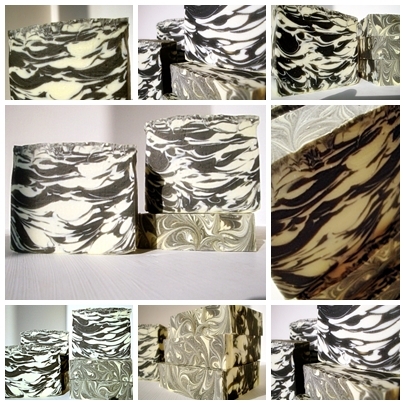 You have patience, my goodness, but this is why your soaps are so unique looking. I always wondered how you got the horizontal stripey-thing going on. It's your signature look. Well done!